In 1983 San Francisco StateUniversity's biology department wanted to close the Sierra Nevada Field Campus and use the savings to support more molecular and genetic research. In contrast the Dean of the College of Science and Engineering, Dr. James Kelley, was an avid supporter of field stations. Dr Kelley understood that students must immerse themselves in the environment they are studying. Otherwise they would be forever misled by limited observations and the resulting bad models. Although Jim Steele was just completing his Masters Degree, Dean Kelley believed Jim Steele was the best person to resurrect and grow the Sierra Nevada Field Campus. Together they turned the rustic Sierra Nevada Field Campus into one of California’s leading environmental education centers. In addition to building the Sierra Nevada Field Campus's environmental education program, Jim Steele also taught several classes: World of Plants, Nature Study, Natural Sciences for Teachers, Bird Banding, and Bird Identification by Song. He was also the principal investigator for the Sierra Nevada Neotropical Migratory Bird Riparian Habitat Monitoring project sponsored by the US Forest Service and that research prompted the restoration of the Carman Valley Watershed. Due to the extreme winter weather conditions, the Sierra Nevada Field Campus only operates during the summer and the director’s position was only halftime and the main duties were during the summer. So instead of pursuing a doctorate, Jim Steele chose to also teach science in San Francisco’s inner city schools during the remainder of the year to fulfill his sense of social justice. The students' honesty and love for learning made him a better teacher and a better person. He realized that if he didn’t get his students to understand the science that enthralled him, then he had simply not made it clear enough. 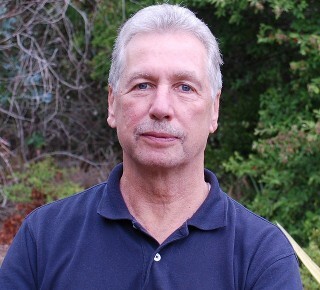 Jim Steele taught 8th grade science at San Francisco's Everett Middle School and Advance Placement Biology, Human Physiology and Genetic Engineering at Wallenberg High School. Later Jim Steele lectured the cell and molecular biology labs for the introductory biology class for majors at San Francisco State University. His understanding of climate change evolved as he sought to understand the causes of the declines in local bird populations that he had studied each summer as part of the Sierra Nevada Neotropical Migratory Bird Riparian Habitat Monitoring project. 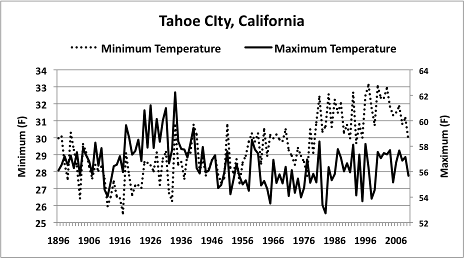 He soon discovered maximum temperatures in the Sierra Nevada had declined since the 30s (see graph) as observed at the nearby Tahoe City weather station that is part of the US Historical Climate Network. It became clear that the Sierra Nevada were not overheating despite publications blaming wildlife extinctions on global warming. The most important factors affecting local climate change were the cycles of El Nino and the Pacific Decadal Oscillation as well as landscape changes that had greatly altered the regional microclimates. Believing the politics of global warming have been misguiding conservation efforts, Jim Steele wrote the book Landscapes & Cycles: An Environmentalist’s Journey to Climate Skepticism. And the lessons learned from his students helped shape his writing style, making the book's science lessons most enjoyable and easily grasped by all.